I loved S. R. Mallery‘s first book, Unexpected Gifts, for its rich and varied historical eras used in the setting and theme of the novel. 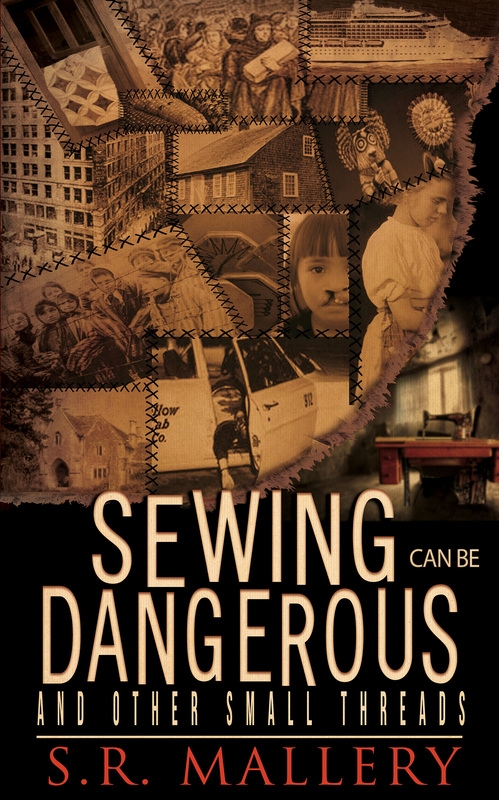 She continues that same talent in her collection of short stories, Sewing Can Be Dangerous and Other Small Threads. The thread that holds the stories together is a literal one as all the short stories employ some type of sewing or weaving of threads at the heart of the plots. The stories are set in important historical eras and are sometimes romantic, sometimes horrific, and always riveting. The life of immigrants who worked in the textile plants during the heyday of the Industrial Revolution are profiled in one of the short stories. It’s not only an indictment of the appalling conditions of the workrooms but Ms. Mallery also examines the yearnings of a young woman who wants to disappear from her cruel and repressive father. Nazi Germany and all its ramifications on those who tried to help the Jews escape from the torture and death at the hands of the Nazis is the setting for one story. A quilt becomes the all important piece of evidence and hope for fifty Jews hoping to leave the country before they were rounded up by Hitler’s soldiers. Medieval courts, Hopi and Chinook native traditions, the sixties from a unique perspective, and more make up the varied and entertaining plots. In the talented hands of Ms. Mallery, this collection of short stories allows the reader to escape into other worlds where even a macrame necklace can become an object of subterfuge and a piece of evidence in a murder case. I thoroughly enjoyed reading each story. I began each one with great anticipation as I discovered the era, setting, and threads to tie it altogether. Sometimes the sewing and thread of the story wasn’t evident, and in other stories, it played a starring role. The divergent historical content is impressive. Ms. Mallery’s research is evident only after completing the story because while engrossed in the plot of each one, I forgot I was reading and simply enjoyed each of the journeys Ms. Mallery created for me. I highly recommend reading this collection of short stories weaved by a very meticulous and talented author. S.R. Mallery’s Amazon Author page – find out more about her and find purchase links for both of her books. This entry was posted in Book Review Friday, Ramblings of a Writer and tagged authors, book reviews, characters, Chinook, fiction, historical fiction, Hopi, Nazi Germany, Nazis, sewing, short stories, sixties, threads, writers. Bookmark the permalink. I’m happy to see you reblogged, Christoph. Thanks for stopping by. I absolutely loved the cover of Unexpected Gifts, quite magical. This is an interesting one too! I agree, Wendy. Sarah’s covers are beautiful and do a very good job of expressing the tone/mood of her stories. Sounds like a powerful collection. Thanks for bringing it to our attention. You’re welcome, Darlene. I think you’d enjoy these stories. I’m reading the book at the moment. So far I’ve read three stories and I love them all. I agree with you on the breadth of the stories and how well they reflect diverse historical eras. I’m looking forward to the rest! That’s wonderful! Thanks for stopping by. Thank you SO much, Patricia, for featuring me. It is much appreciated, and thanks to your readers who have made such nice comments! You’re very welcome. I very much enjoyed these stories, so I hope they receive a wider audience. These are a real treat, Hazy!